Why do we die? Why can’t we live forever? What happens to us after death? Moving between science and culture, After Life: Ways We Think About Death takes a straightforward look at these and other questions long taboo in our society. By showing the fascinating, diverse ways in which we understand death, both today and throughout our history, the book also shines a light on what it is to be human. Each chapter includes a brief telling of a death legend, myth or history from a different culture or tradition, from Adam and Eve to Wolf and Coyote, and ends with a section on a common theme in our thinking about death, such as rivers and birds in the afterlife, the colors that different cultures use to symbolize death, and, of course, ghosts. The final chapter is about grief, which is both a universal human experience and unique to each person. The text offers suggestions for ways to think about our grief, when to ask for help and how to talk to friends who are grieving. I read a lot of books about death, including scientific, cultural, social and historical perspectives. What excited you about writing on your topic? My research on what kinds of books about death were already available for kids showed that there really wasn’t much—or anything—like this for this age group. All the librarians, teachers, booksellers, counselors, parents and grandparents I spoke to said there was a real need for this book. So it felt like an important thing to do, something that could really be helpful to a lot of people. At first I was a bit scared of the topic, but when I started really digging into it I realized that learning about death is actually learning about what it is to be human. We all die, and every culture that has ever existed has struggled with the reality and mystery of it; it’s part of our humanity. What types of sources did you use when researching for your book? Mostly books, books, books. And some online research for backup. Hmm. My favorite genre is the short story. Maybe someday. What are some of the challenges of writing nonfiction? I think the main challenge these days, when we are so surrounded by and saturated with information (and misinformation), is finding facts that really are facts—and finding a balance between too much and not enough. What is the most rewarding part of writing nonfiction? Telling readers about things that they might not otherwise have known, possibly shifting their perspective a tiny bit, and encouraging them to ask questions and think about things beyond the scope of the book. Since death is such a taboo topic in our culture, I think ANY conversation is good! But I hope that readers will find it as fascinating as I have and will be a little less afraid to think and talk about it—whether in a classroom, at home or in the car on the way to soccer practice. Death isn’t an easy topic, but I think our culture will be a little bit healthier when we can speak more freely about this thing that will ultimately happen to all of us. 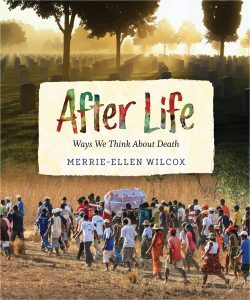 After Life: Ways We Think About Death is available now. 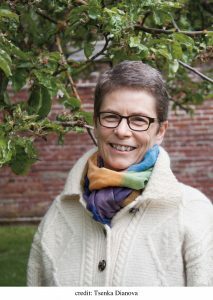 Merrie-Ellen Wilcox is a writer and editor whose first book for children, What’s the Buzz? : Keeping Bees in Flight, is part of the Orca Footprints series. She has two adult children and lives in Victoria, British Columbia, with her husband and a busy Jack Russell. For more information, visit merrieellenwilcox.com.